Working out with your partner can be a means of connecting with him or her physically and emotionally. The best couple workout will not only offer you a healthy, fit body it will also help you have a deep, harmonious relationship with your partner. 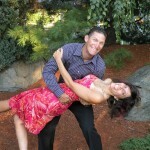 In fact, it is a fun and healthy way to spice up your relationship. You will need a ball for this activity. How-to: Stand back-to-back with your partner and lower yourselves into a squat, keeping your butts leveled with your knees. Let your partner hold the ball on both hands while you place your hands on your chest. Let your partner twist to the left passing the ball as you twist to the right to receive it. Switch direction, this time you should be doing the passing and your partner should be the one receiving the ball. Repeat the routine for as many as you can. How-to: Stand in front of your partner about two feet away. You should get into squat positions, with arms bended at chest level, palms out. Let your partner jump high with arms extended overhead. As soon as he/she lands you should jump up. Once you landed, it will be your partner’s turn to jump again. Continue this alternate squatting and jumping until each of you completes at least 15 jumps. How-to: Stand back to back with your partner, one foot apart. Let your partner hold the ball overhead while you extend your arms to receive it. After receiving the ball, you should both bend forward as you will have to pass the ball between your legs while your partner receives it. Repeat this routine as many as you can. You will need 2 resistance bands for this activity. How-to: Sit on the floor facing each other with your legs positioned wide apart. Make sure that your feet touch the feet of your partner. Hold one end of each resistance band and let your partner hold the other ends. Lean backwards with your back making a 45-degree angle with the floor. Start with your elbows glued to the side of your body and your arms leveled with your stomach. You and your partner should simultaneously raise your arms toward your chest. Lower your arms again, and then repeat the routine. Stand facing each other. Extend your arms and grab each other’s wrist. Raise and extend your left leg while your partner does the same with his/her right leg. Slowly get into squat position while keeping the legs raised. Stand straight up and repeat the routine with the other leg. Do as many repetitions as you can. 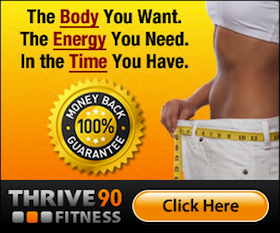 If you enjoy working out with your spouse, you’ll want to check out our Thrive90 Fitness program. 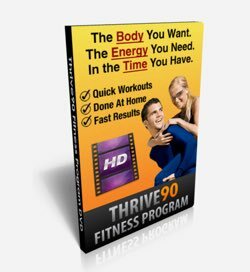 It’s a comprehensive, 90-day system that will transform your bodies together while you have fun and deepen your recreational intimacy!